Refugees stuck on the Hungarian-Serbian border have declared a sit-down hunger strike, demanding to be allowed to proceed further into the EU, according to Twitter reports. Social media reports say refugees stuck on the border are holding banners, saying "No food no water until open border." Earlier on Tuesday, Hungarian authorities decided to declare a crisis in two southern counties due to the influx of refugees. According to Gyorgy Bakondi, head of the national disaster unit, the border zone in these counties would be extended to 60 meters from 10 meters. "This can serve to temporarily place persons seeking refugee or protected status as well as to process asylum claims and alien registration procedures," he said as cited by Reuters. Media reports suggested that the counties in question are Bacs-Kiskun and Csongrad. In the meantime, on the other side of the Hungarian-Serbian border hundreds of migrants and refugees have pressed against the barrier demanding to cross the border and enter Hungary. Banging on the metal barrier, they shouted "open border, open border!" a Reuters reporter said. Police stood by on the other side. 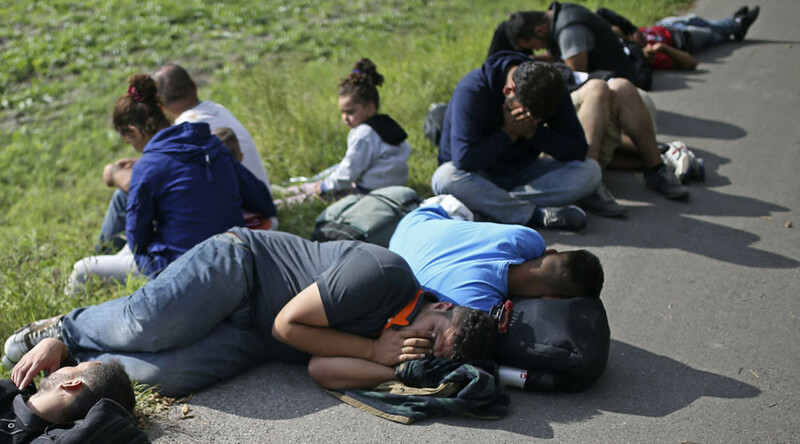 Many of the asylum seekers are sitting on the main highway from Serbia to Hungary. "I will sit here until they open the border. I cannot go back to Syria. Life in Syria is finished," a Kurd from Syria, who called himself Bower, told Reuters. Hungary has closed its border with Serbia ahead of schedule, after a record 5,809 refugees entered the country on Sunday, with more than 190,000 crossings recorded so far this year. Starting on Tuesday, Hungary began implementing tougher border measures. On Monday night, Hungarian authorities finished erecting razor wire fences along the border. An apocalyptic-looking train wagon with razor wire attached to its front was used to seal a railway passage near Roszke village. This closed all crossing points with Serbia except official road checkpoints. As a result fewer migrants crossed the border to Austria overnight, a spokesman for the Austrian police in the eastern province of Burgenland told Reuters. "We have had around 1,800 people from midnight until now. We think that many thousand people were still on the move in Hungary before the border closed and they will surely make their way to [the town of] Nickelsdorf here in Austria and try to continue their journey to Germany," the spokesman added. On Tuesday, police rounded up 9,380 migrants crossing Hungary from Serbia, police told Reuters. Budapest announced it will reject refugees illegally entering the country from neighboring Serbia. "Certainly, as that is the international legal rule, therefore it must be done that way," said government spokesman Zoltan Kovacs. Hungarian authorities closed the airspace along the Serbian border on September 10, the National Transport Authority said, adding that the closure doesn’t affect international passenger flights. UNHCR spokeswoman Melissa Fleming said a new route for asylum seekers may be opened after Hungary closed its borders. "We're definitely in touch with different countries on contingencies and UNHCR is ready to move and assist different countries as best we can," Fleming said. "It's going to be just as much a struggle as it has been for Macedonia and Greece."